Equal parts classical percussionist, contemporary music junkie, arts leader, and wannabe rockstar, Josh McClellan is a relentless and exuberant musician who currently resides in Austin, Texas. Whether he is performing Steve Reich’s Nagoya Marimbas in a brewery or playing Prokofiev’s Fifth Symphony at Lincoln Center, his primary mission is to cultivate a uniquely diverse musical life of refined, spirited performances that serve to bridge the current divides between traditional and popular audiences. A recent graduate of the Eastman School of Music, he performed this past year as an artist at the Percussive Arts Society International Convention with the Eastman Percussion Ensemble, winners of the 2017 International Percussion Ensemble Competition. This performance was critically acclaimed by EVANS Drumheads as being “fresh, dynamic, and expertly polished.” In May 2017, he toured with the Eastman Wind Ensemble to MusicFest Canada and performed in a recording of Jeff Tyzik’s Images, which will be released as part of a new album in 2018. He also appears in a recording of Matt Curlee’s Decay No. 1 with the Eastman Percussion Ensemble produced by Four/Ten Media. McClellan has spent three summers as a student at the Aspen Music Festival and School. In 2017, he attended as the recipient of the Charles Owen Percussion Fellowship, a prestigious award that has been given to many of today’s leading percussionists. Many of McClellan’s collaborative performances in Aspen received critical acclaim from the Aspen Times. These include a performance that included George Crumb’s monumental American Songbook IV: The Winds of Destiny as well as Augusta Read Thomas’ “Selene” with members of the Aspen Percussion Ensemble in August 2017, a performance of Xenakis’ Persephassa in 2015, and a tribute concert of music by Frank Zappa arranged for percussion in 2014. A personal highlight for McClellan during his summers at Aspen was a participating in a “tempestuous performance” of Strauss’ “Ein Heldenleben” with Rafael Payare conducting. McClellan is grateful to have also performed under other esteemed conductors such as George Manahan, Jun Märkl, Robert Spano, and Markus Stenz. In all aspects of his performance life, McClellan continuously balances serious academic study with creative projects and enriching community engagement opportunities. During his time at Eastman, he performed in many challenging programs of contemporary repertoire ranging from Boulez to Lachenmann, and he focused his individual musical studies toward the performance of standard percussion masterworks alongside newer additions to the canon of solo repertoire. While completing his Bachelor of Music degree at Belmont University, he frequently presented exciting, new repertoire to new audiences through giving the Nashville premiere performances of Judd Greenstein’s “we shall be turned” as well as Steve Reich’s “Mallet Quartet” on his degree recitals. Committed to engaging non-traditional audiences, Josh also performed as a section percussionist in the Nashville Philharmonic Orchestra from 2013 to 2016, and he has participated in multiple Make Music events in Nashville and Chicago organized by the International Music Foundation. His past principal teachers include Michael Burritt, James Ross, Charles Ross, Dr. Christopher Norton, Tim Genis, Dr. David Steffens, Dr. Blake Tyson, and Chalon Ragsdale. 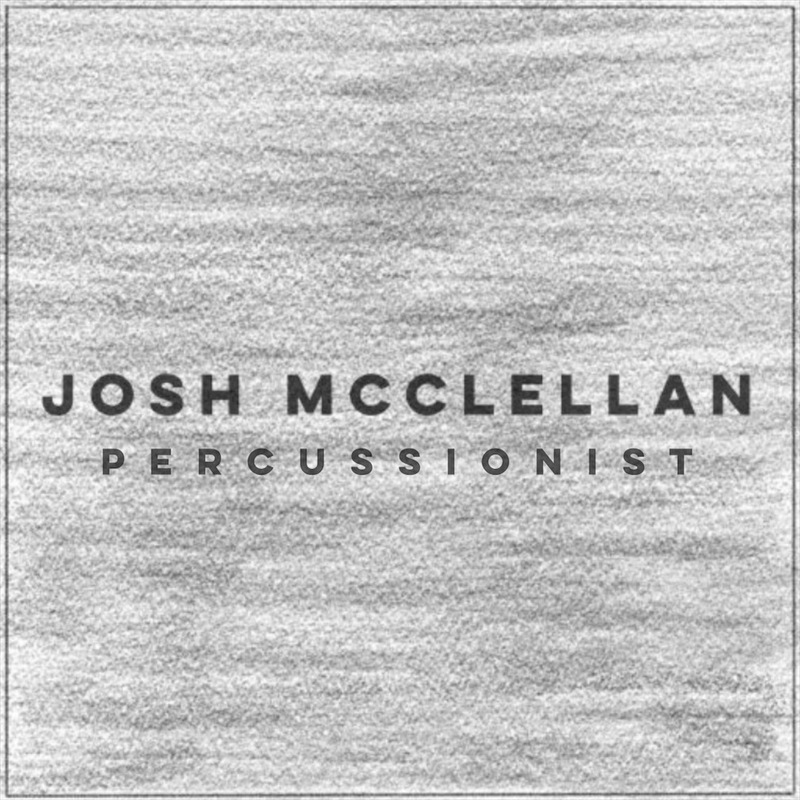 McClellan is also a member of the Percussive Arts Society. Outside of the concert hall, McClellan has spent much time cultivating his abilities and experience within arts leadership and administration. He received the Arts Leadership Certificate from the Catherine Filene Shouse Arts Leadership Program at Eastman, a nationally recognized program that provides free resources to a select group of students focused on entrepreneurship and administrative skills, culminating in a paid internship. As the Concert Office Intern at Eastman, McClellan worked behind-the-scenes with esteemed guest artists such as Chick Corea, Steve Gadd, Bill Murray, So Percussion, Jan Vogler, and many others. Josh also worked as Young Artists Orchestra Manager at the 2018 Boston University Tanglewood Institute, a prestigious summer program that trains highly skilled young musicians from around the world. Josh’s non-performance interests include photography, audio-video production, hiking, reading, contemporary visual art, and Sufjan Stevens’ discography. For more information about Josh, click one of the links below.